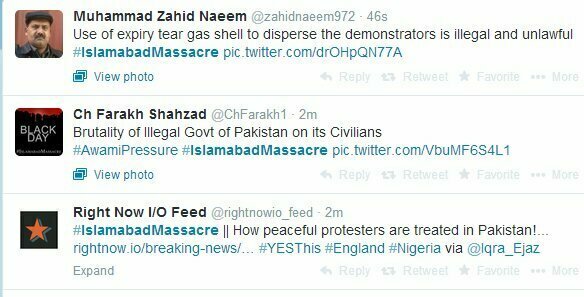 With the incident that took place last night in Islamabad, when Pakistan Awami Tehreek and Pakistan Tehreek-i-Insaaf protestors marched towards Prime Minister House in Red Zone, people of Pakistan have been up all night long and hash tag #IslamabadMassacre is the top trend since yesterday night. Not only updates of the situation but people have been sharing their personal views upon this action taken by Government of Pakistan Muslim League (N). 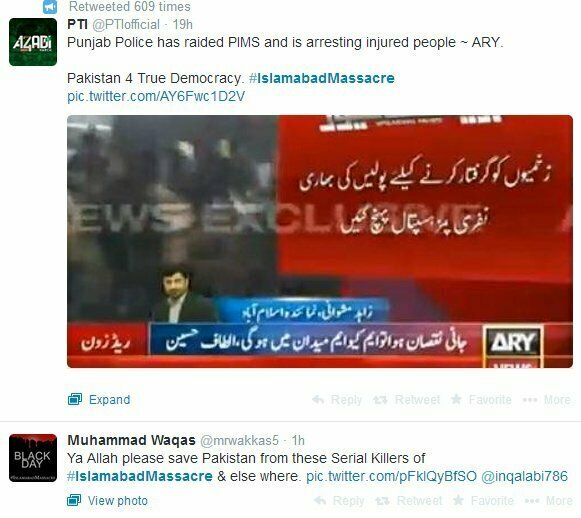 Collectively people are against this brutal use of power by PML(N) and Punjab Police. Punjab Police has been throwing tear gas shells all night and all day today. Till yet different number of casualties have been reported by different news channels but 3 casualties is what all channels agree upon. Along with 3 martyred, several hundred have been injured and this number is somewhere around 500. Last night was a night that people living in Islamabad had never witnessed before. Not only male protestors but women and children also were injured in huge numbers. Many female protestors passed away due to excessive and brutal use of tear gas. Different channels claimed that tear gas was expired and it was lot more poisonous than usual one. Due to this action, the popularity of PML(N) seems to drop by a huge margin. PTI chairman Imran Khan has announced that PTI will register an FIR against Choudhary Nisar and Prime Minister Nawaz Sharif for the martyred people. 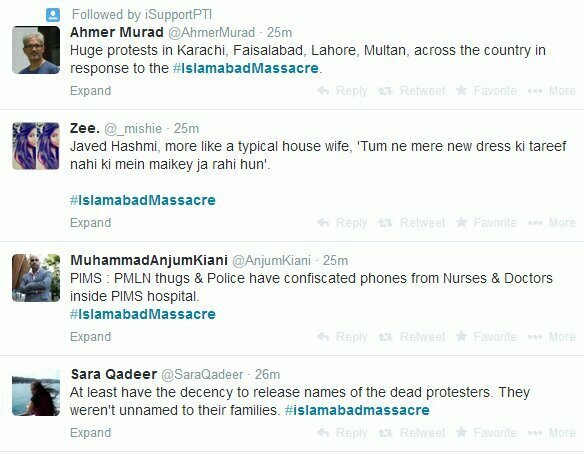 After last night’s #IslamabadMassacre; PTI Chief requested people all over the country to protest against this brutal act of Nawaz Sharif. Many other small parties have welcomed the call from PTI and PAT leaders and tomorrow is going to be a busy political activity day throughout Pakistan. is merciful. saleem (faqir) . I am enjoying my life. Thanks Canada.